Some outfits and accessories make people feel like they were made just for them. That’s a special feeling Urban Mills Promotions & Boutique in Lebanon strives to create for its shoppers with exclusive items and customizable pieces. But if you had asked owner Ramona Welch a few years back if she would one day have a boutique, she might have laughed. It’s been an unlikely journey for Welch, who taught for 15 years and always had a passion for helping children. After leaving the school system, she worked in sales for a couple of years before venturing out and starting her own business in April 2015. Welch opened Urban Mills Promotions located in The Mill at Lebanon, offering custom screen prints, embroidery and promotional products. Her daughter, Carly Lee, was the one in the family with the passion for clothing. She was studying fashion merchandising and design at Tennessee Tech when she began telling her mother she should add clothing to her store. A year later after graduating from TTU, Lee came to work for the shop. They began offering clothing and moved to a larger location in The Mill. They both brought their expertise to Urban Mills and said they loved working together. “It’s the best of both worlds because she’s my best friend and my mom,” Lee says of her mother. Their shop is on the corner of the Square connecting to the Capitol Theatre, with plenty of windows for people to get a glimpse of what’s inside this stylish boutique. They say they’ve had visitors tell them the location reminds them of Franklin Square — but better. Shoppers will find boutique clothing (sizes X-Small to 3X), baby items and clothing, jewelry, shoes, accessories, local artwork, gift items, home décor pieces and more. 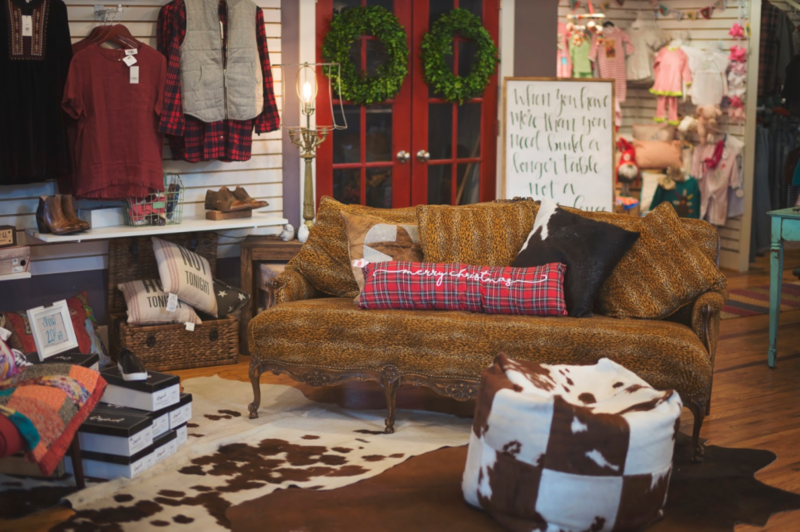 They also carry Decohides cowhide rugs that have been especially popular and can be seen hanging up in the store. “We can’t keep them in the store,” Lee says of the quick-selling hide rugs. There are also plenty of Christmas décor and clothing pieces to get people in the spirit, including festive baby clothing up to 4T, ornaments, towels, scarves and more. 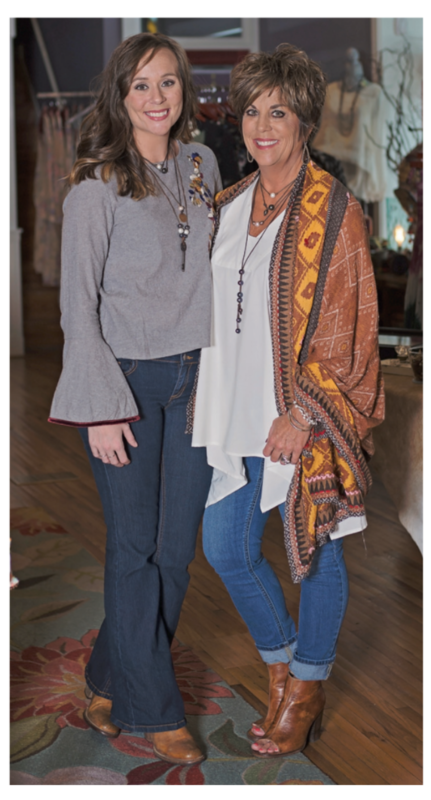 To set Urban Mills apart, the mother-daughter duo look to carry brands that will sell exclusively to them, keeping their customers from seeing their outfits worn by dozens of others around town. 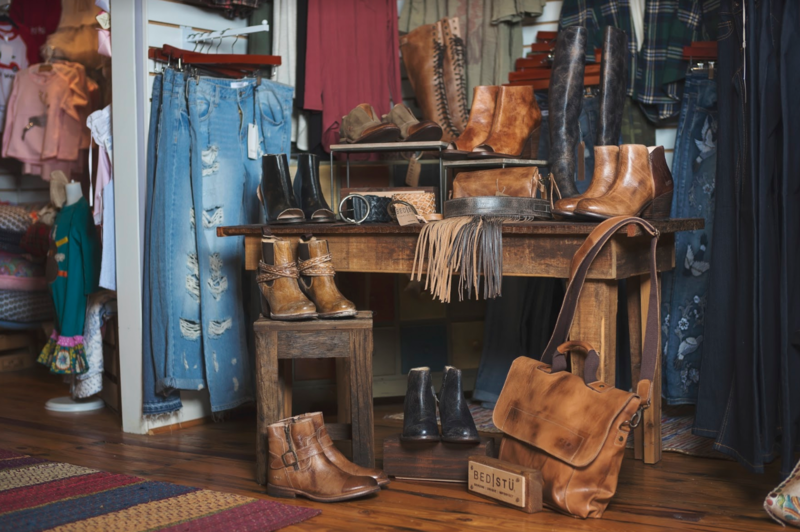 One of their most popular brands is Bed Stu, which offers leather items like boots, purses and belts, Lee says. They also carry pieces from Tempo Paris, Molly Bracken, Mud Pie, Aratta and others. For truly one-of-a-kind pieces, Lee creates shirts, hats, jackets and more for their in-house brand, UM Design. Being able to showcase her creativity through her brand has been a neat and rewarding experience, she says. Urban Mills also offers screen printing, heat transfer, digital prints, promotional items and embroidery in the back of the store. 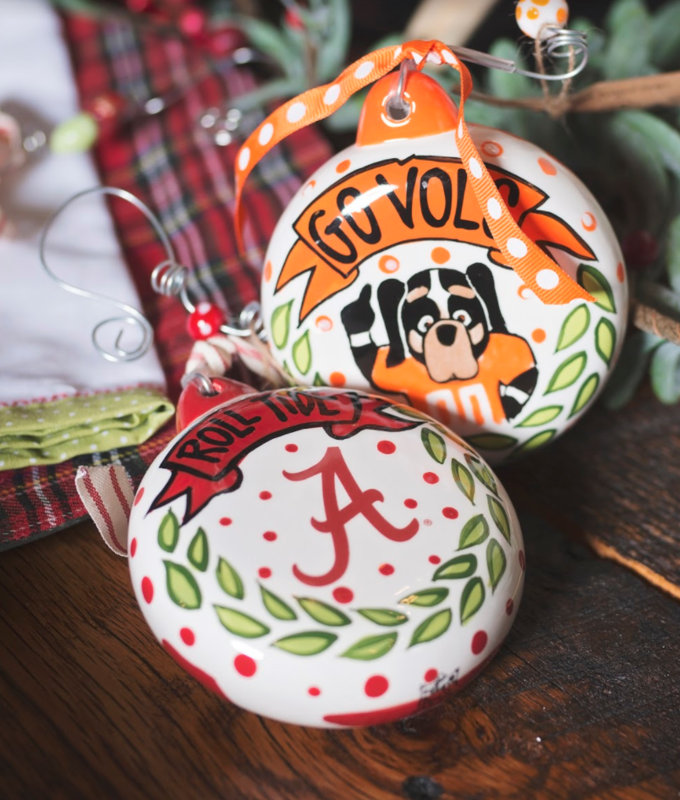 Their items are perfect for businesses, schools or individuals who want a custom item. “We can put your name or logo on just about anything,” Welch says. The pair says the business has been made possible with the support from both of their husbands. Welch and her husband Andy have been married 33 years and also have a son, Cal — who has two children, Emery and Andrew, with his wife Lauren. Lee and her husband, Blake, have a 19-month-old son, Tritt. Follow them on Facebook, or email Urbanmillspromo@gmail.com for more information.